Bill Emery and Kim Graham Rawlins proudly display their catch for the day, two nice 20+ pound Ono. featured in the photo with Kim is Fire Hatt’s First Mate, Austin Toth. Nice Job Guys! 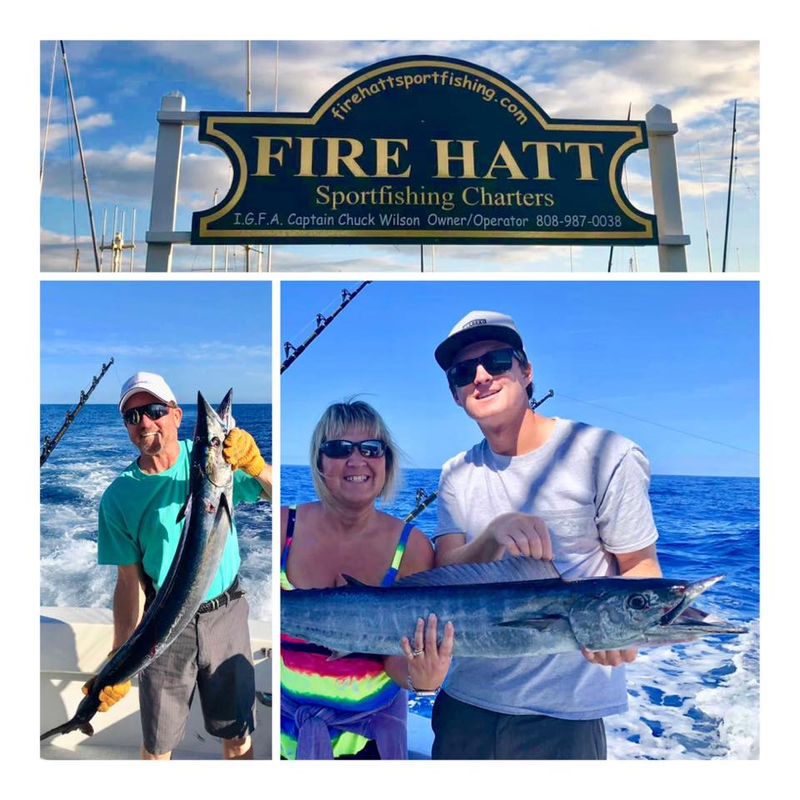 When Bill Emery and Kim Graham Rawlins arrived in Kona for Spring Break, their main goal was to escape to paradise and go fishing aboard Fire Hatt, enjoy sunsets, have a lot of beach time, enjoy good meals and just chill. Bill’s main goal was to catch food fish. Sometimes that is a tall order. We headed out to “Ono Lane” and had our first fish early. Bill brought in a nice 20+ pound Ono. We had another mystery bite and then on the way back to the harbor, we had a Hail Mary bite just as First Mate Austin was starting to bring in the lines. Kim is in the chair and brought in her 20+ pound Ono! Neither Bill nor Kim had ever caught this species. They did great! We had excellent weather, calm water and we were so lucky to have had such a great fishing & memorable experience with an awesome couple!! They couldn’t wait to eat some of their fresh catch, so Captain Joe sent them to a local restaurant that will prepare some of the Ono for them for dinner!! Armed with a cooler full of Ono, Bill and Kim returned to North Pole, Alaska where they will have fond memories every time they enjoy their catch from paradise. Fishing in Kona Hawaii has always been known for the calm waters and sunshine. Bill and Kim have been fishing in Alaska, Mexico and Hawaii. They put this trip is at the very top as their favorite!